So pure a flute the fairy blue. I am called the Wood Pewee, but I don’t always stay in the woods. If you have an orchard or a nice garden, you will hear me singing there in June. People think I am not a happy bird, because my song seems so sad. They are very much mistaken. I am just as happy as any other little fellow dressed in feathers, and can flirt and flutter with the best of them. That is my song, and my mate thinks it is beautiful. She is never far away, and always comes at my call. No; one day, when we were busy building our nest—which is very pretty, almost as dainty as that of our neighbor the Humming Bird—she flew away to quite a distance to find some soft lining-stuff on which to lay her eggs. I had been fetching and carrying all day the lichens to put round the nest, which was hidden among the thick leaves on the bough of a tree, and was resting by the side of it. “She will hear that,” thought I, and again I sang it as loud as I could. “I’ll bring that fellow down, too,” said a boy, who surely had never heard anything about our happy, innocent lives, and as I peered down at him, he flung a large stone, which struck the bough on which I sat. Oh, how frightened I was, and how quickly I flew away! “He has killed my little mate,” I thought. Still, I called in my plaintive way, Pewee! Pewee! Peer! A faint, low cry led me to the foot of a large tree, and there on the ground lay my mate, struggling to rise and fly to me. I petted her with my broad, flat beak, and after a while she was able to fly with me to our nest; but it was days and days before she was out of pain. I am sure if that boy sees my story in Birds, he will never give such an innocentlittle creature misery again. I dress plainly, in a coat of olive and brown, and they do say my manners are stiff and abrupt. LTHOUGH one of the most abundant species, common all over the United States, the retiring habits, plainness of dress, and quiet manners of this little bird have caused it to be comparatively little known. Dr. 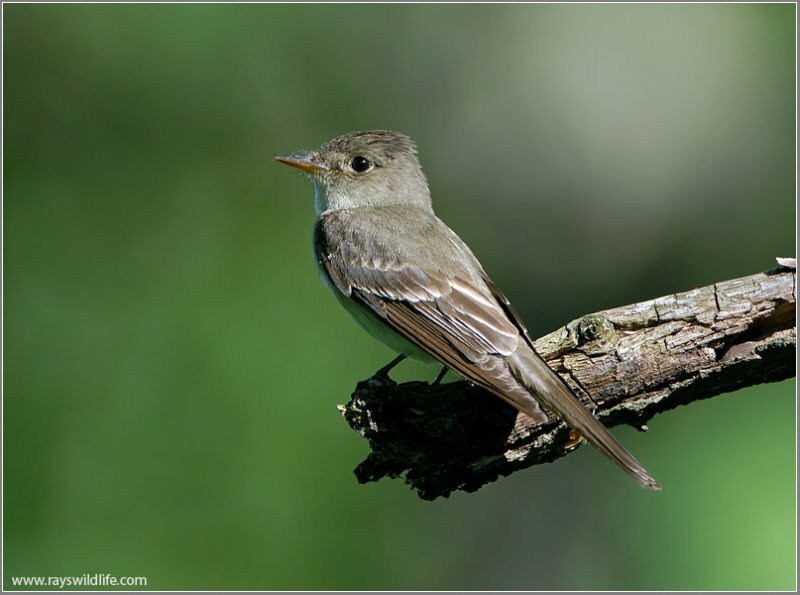 Brewer says that if noticed at all, it is generally confounded with the common Pewee, or Phoebe bird, though a little observation is sufficient to show how very distinct they are. The Wood Pewee will sit almost motionless for many minutes in an erect position, on some dead twig or other prominent perch, patiently watching for its insect prey. While its position is apparently so fixed, however, its eyes are constantly on the alert, and close watching will show that the bird now and then turns its head as its glance follows the course of some distant insect, while anon the feathers of the crown are raised, so as to form a sort of blunt pyramidal crest. 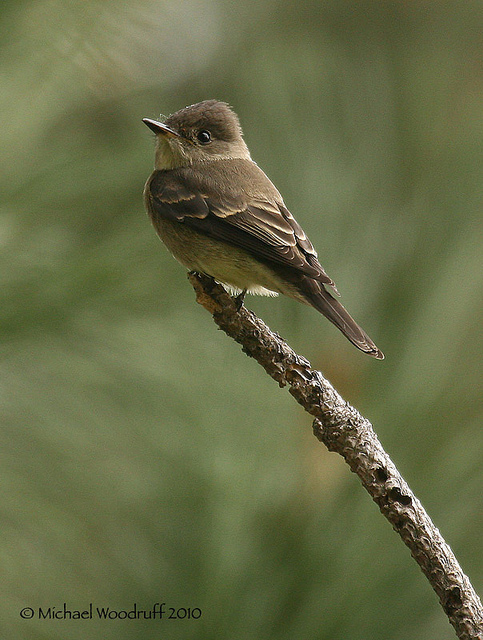 This sentinel-like attitude of the Wood Pewee is in marked contrast to the restless motion of the Phoebe, who, even if perched, keeps its tail constantly in motion, while the bird itself seldom remains long in a fixed position. The notes of the two species (see August Birds) are as different as their habits, those of the Wood Pewee being peculiarly plaintive—a sort of wailing pe-e-e-e-i, wee, the first syllable emphasized and long drawn out, and the tone, a clear, plaintive, wiry whistle, strikingly different from the cheerful, emphatic notes of the true Pewee. The Wood Pewee, like all of its family, is an expert catcher of insects, even the most minute, and has a remarkably quick perception of their near presence, even when the light of day has nearly gone and in the deep gloom of the thick woods. Dr. Brewer describes it as taking its station at the end of a low dead limb, from which it darts out in quest of insects, sometimes for a single individual, which it seizes with a sharp snap of its bill; and, frequently meeting insect after insect, it keeps up a constant snapping sound as it passes on, and finally returns to its post to resume its watch. While watching it occasionally twitters, with a quivering movement of the head and tail, uttering a feeble call-note, sounding like pee-e. 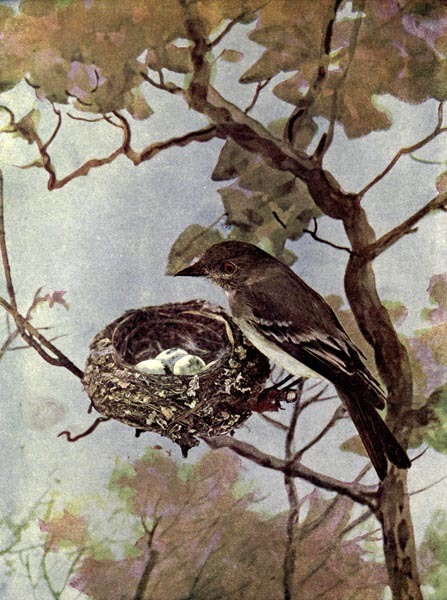 The nest of the Wood Pewee, which is always “saddled” and securely attached to a rather stout branch, usually lichen-covered, is said to be one of the most elegant examples of bird architecture. From beneath it so much resembles a natural portion of the limb, but for its betrayal by the owner, it would seldom be discovered. It is saucer-shaped, with thick walls, and the whole exterior is a beautiful “mosaic” of green, gray, and glaucous lichen. The eggs are a rich delicate cream color, ornamented by a “wreath” round the larger end of madder-brown, purple, and lilac spots. The Wood Pewee has many admirers, a more interesting creature to watch while feeding being hard to imagine. Often you will find him in the parks. Sitting in some quiet, shady spot, if you wait, he will soon show himself as he darts from the fence post not far away, to return to it time after time with, possibly, the very insect that has been buzzing about your face and made you miserable. His movements are so quick that even the fly cannot elude him. Range—Eastern North America; breeds from Florida to Newfoundland; winters in Central America. Nest—Compact and symmetrical, of fine grasses, rootlets and moss, thickly covered with lichens, saddled on a limb, twenty to forty feet up. Eggs—Three or four, white, with a wreath of distinct and obscure markings about the larger end. This entry was posted in Birds, Birds of the World, Kid's Section and tagged Birds Illustrated by Color Photography, Birdwatching, Christian, From The Past, Home School, Kids, Photography, Tyrannidae, Tyrant Flycatchers, Wood Pewee, Youth. Bookmark the permalink.